A fun low cost group holiday craft activity! Enough materials for 72 personally created 2" ornaments with NO glue needed. 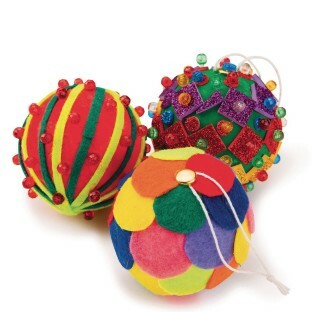 Includes styrofoam balls, self-adhesive foam glitter squares in assorted colors, 9" x 12" self-adhesive felt sheets (customer needs to cut into desired shapes), assorted color gem pins, 6 assorted paint colors, brushes, paper fasteners, string and instruction guide. Really enjoyed this project! Worked with a group of children ranging in ages 5-16 plus a few adults. There were so many options provided to complete the ornaments which really encouraged creativity. Very young children may need a little help with the cutting on some of the designs however there were options available that they could be successful with on their own as well. We were very happy to have all the choices. You get a lot for the money! Would definitely order again.